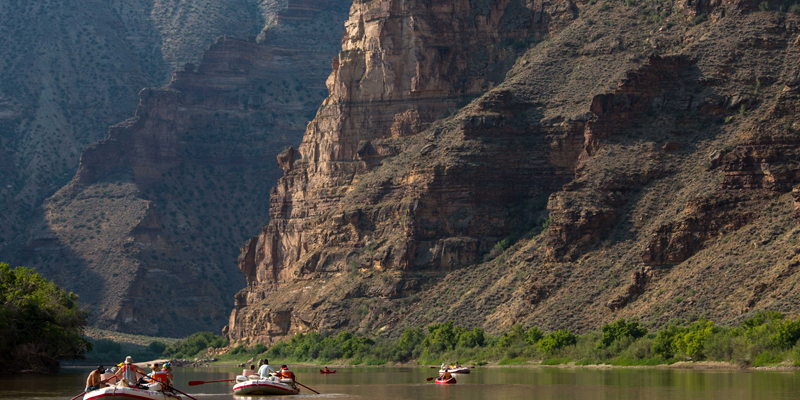 Rafting on the Green River through Desolation Canyon takes you and your family on a thrilling adventure over and through some of the most remote parts of the continental United States: The Tavaputs Plateau. This region was home to the Fremont Indians for thousands of years and later became a hideout for some of America’s most notorious outlaws. You’ll find a remarkable array of wildlife among the tall, rainbow-colored cliffs sculpted by centuries of wind and water. This trip begins with a scenic flight over the Tavaputs Plateau and the river canyons, giving you a bird's eye view of the region that explorer John Wesley Powell called "a region of wildest desolation". As the Green River flows through Desolation Canyon, it is peppered with groves of cottonwood trees and white sand beaches. 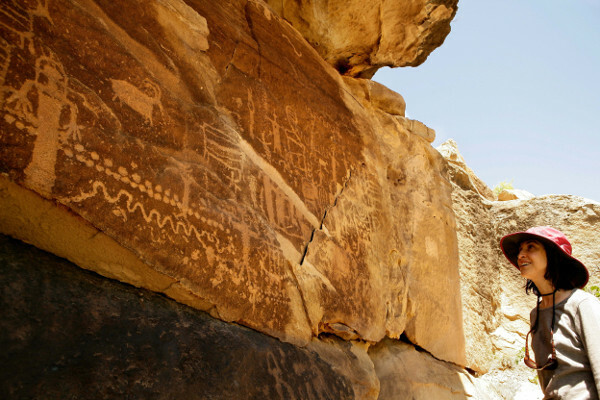 Side canyons abound with caves and ancient petroglyphs, and archaeologists have been visiting the area for many years uncovering its amazing history. Rich stories and consistent, fun whitewater make Desolation Canyon the perfect trip for families. Starting at the Sand Wash boat ramp in the center of the Tavaputs Plateau, this 84-mile whitewater rafting trip into Desolation Canyon takes us on the ride of a lifetime through over 60 rapids! The whitewater builds in intensity each day and finally leads you out of the plateau at Swasey's take-out, just north of our Green River headquarters. 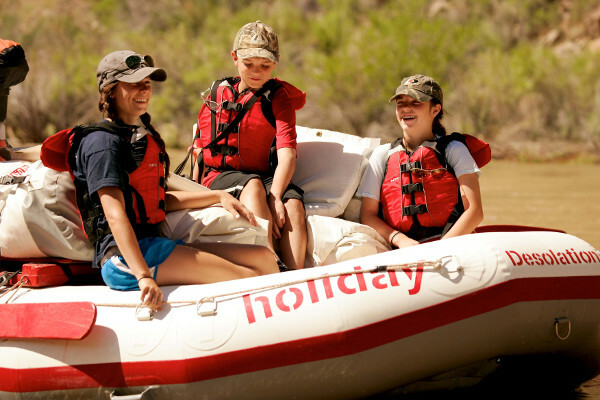 One of the advantages of rafting Desolation Canyon is the flexibility of the daily itinerary. It can vary widely from one trip to the next based on group desires, Mother Nature, and courtesy for other groups on the river. This sample itinerary illustrates a five-day trip through Desolation and Gray canyons. In August, we lengthen the Desolation Canyon trip by one day due to lower water levels. When you arrive in Green River the day before your trip, there will be a pre-trip orientation meeting at 8:00 p.m. Mountain Time. A Holiday representative will give you a short orientation on all aspects of river travel. At this time we will issue your waterproof bags, answer any questions you may have, and finalize your flight departure time for the trip. If you plan on buying any last minute items from our accessories store, please plan to do so at this time (see our packing checklist for a list of items you can find at our store). Special Note: Due to the limited space and weight on the aircraft, if you have any specialty sodas, beer, wine, or other extra heavy or bulky items, please bring items to our headquarters by 2:00 p.m. the day prior to your trip. Day 1: On the morning of your trip, plan to arrive promptly at the predetermined time established at the pre-trip orientation meeting. We will then take you to the local airstrip. Our pre-scheduled flight will be waiting to take you to the embarkation point (approximately 30 minutes in the air). The flight is on a small, single-engine type aircraft. There is a 30-minute downhill hike from canyon rim to the rafts waiting at the river bottom. Plan ahead to wear appropriate shoes for the hike. Guests who are apprehensive about the hike can be transported by vehicle to the river. Talk to the river rangers about the significance of the wilderness you are about to enter, and then start floating! Watch cliff swallows explode out of their nests as the walls rise around us. 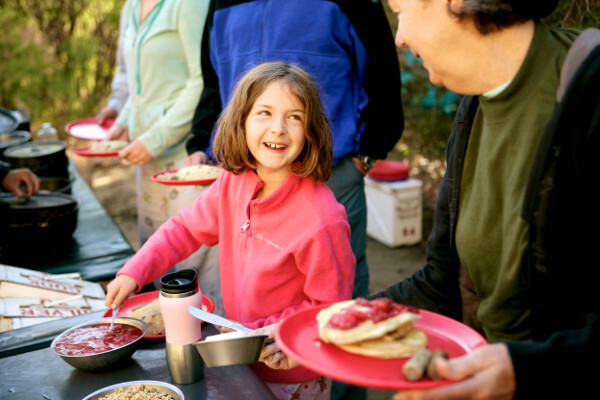 Take a short hike to see a turtle fossil, and make camp on a sandbar or in a grove of cottonwood trees. Day 2: Enjoy a few more miles of calm water as we row around Peter's Point. Lighthouse Rock, named by John Wesley Powell, clues us in to the whitewater just around the corner. 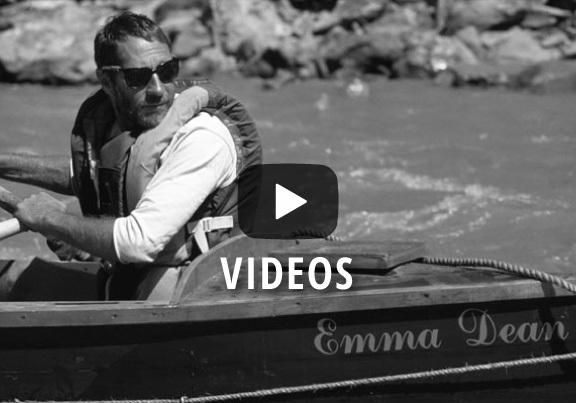 Hop in an inflatable kayak to splash through our first rapids. Hike to one or more ancient Fremont cultural sites or explore a side canyon. Day 3: Wander around the historic Rock Creek Ranch, where Butch Cassidy's Wild Bunch slept, and try to spot granaries, ancient food-storage structures, on the canyon walls. Hold on tight (or paddle hard!) through rapids such as Chandler Falls and the biggest of them all, Cow Swim. Born of a flash flood in 2008, it marks the former location of historic cattle ford. Day 4: Desolation's walls soar, red and rugged, into the sky, a colorful finale as we transition into Gray Canyon. Today brings continued whitewater fun with Wire Fence, Three Fords, and Coal Creek rapids. Look for evidence of a planned dam site on the hike to scout Coal Creek, and poke around in the ruins of a surveyor's cabin just downstream. Day 5: Several more rapids to go, and a few more hours to listen to the song of the canyon wren as we approach the end of the canyon. We'll have lunch and maybe squeeze in one more cultural site before arriving at the take out at Swasey's Beach. We will return you to Green River, Utah (20-minute van ride). Our expected time of arrival back at our headquarters is 3:00 to 4:00 p.m. If you are on a 6-day Desolation Canyon rafting trip, you can expect a similar itinerary to this 5-day trip. 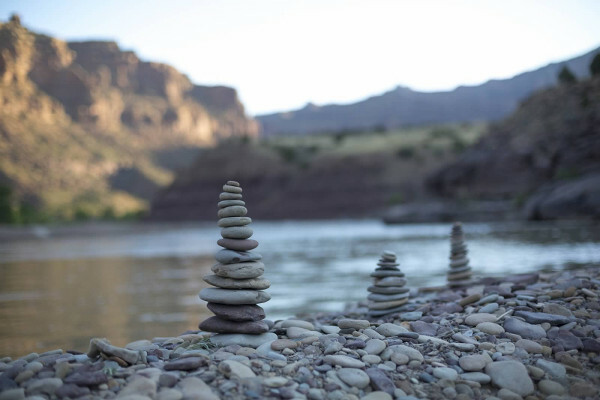 However, with lower late-season river flows and an extra day to play, you will most likely see different campsites than your 5-day counterparts. As mentioned earlier, this is a sample itinerary and should not be thought of as the trip you will experience. It is intended to give an idea of what the trip will be like. It could also be exactly what you do. Keep an open mind, be flexible, go with the flow, and enjoy rafting Desolation Canyon! Guides were awesome, knowledgeable on the region, great fun & hosts. Awesome 5 day adventure, Dustin, Mac & Rachael were terrific hosts transporting us through one of this planets most spectacular landscapes, many thanks. This was an incredible family vacation. We have recommended it to many friends and would do it again in a heartbeat. Huge shout out to our guides who were professional, knowledgeable, fun, outgoing... we could go on and on. A diversity of shorter and longer hikes would have been fun for the folk who wanted to get moving a bit and explore the side canyons. 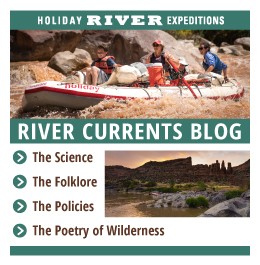 Holiday Expeditions is an incredible river outfitter! Professional, fun, hard working, knowledgeable, and just wonderful all around. I would recommend them to anyone looking for a great experience on the river!